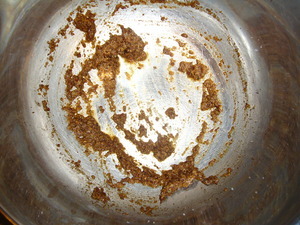 Heat oil in a small frying pan. Add garlic and ginger. Saute till fragrant, about 1 minutes. 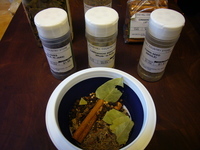 Add Garam Masala, cumin, and chili powder. Saute for another minute till fragrant. Remove from heat. Place half of the spice mixture in a bowl big enough to hold the yogurt. Add the yogurt and two tablespoons of the lime juice. Set aside. 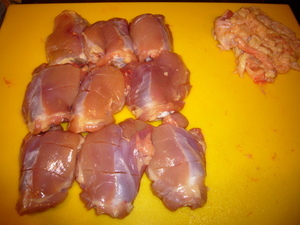 Trim the thighs and cut a 1/8 inch deep slice, twice, across each thigh. 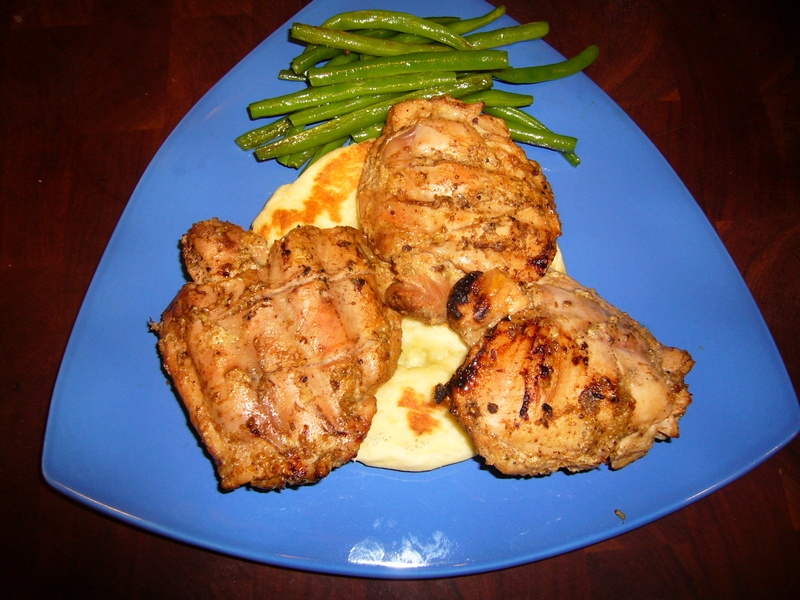 Combine the remaining spice mixture with the salt and the remaining lime juice in a bowl big enough to hold all the chicken. 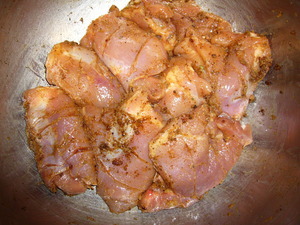 Massage the spice mixture into and all around the chicken thighs... Allow to sit for at least a half hour. 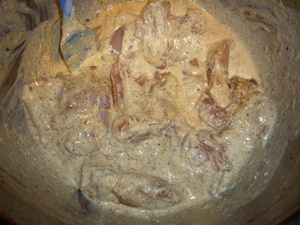 Add the yogurt mixture to the chicken and stir to coat each piece. Place on rack, direct heat. Turn after about 5 minutes. 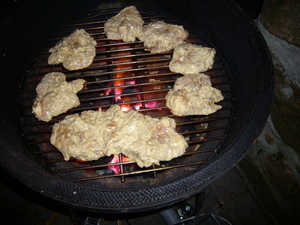 Cook another 5 minutes or till internal temperature reaches > 150. Serve with nan and lime slices. 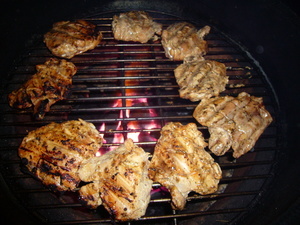 You want a few dark or charred areas on the chicken. Process in TM at speed 8 until desired consistency. 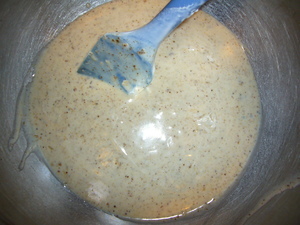 Place the water, salt, and yeast into the TM. 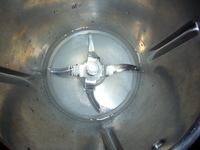 Process at speed 4 for about 10 seconds or till the salt and sugar are dissolved. 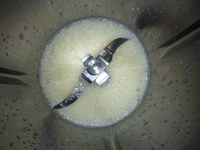 Add the egg, and process another 2 seconds at speed for to mix in the egg. 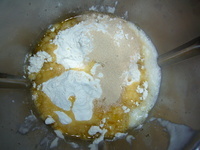 Add the remaining ingredients, starting with the yogurt. Process for 7 minutes on intermittent speed. 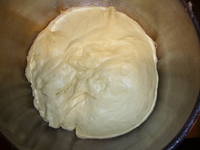 Place dough in a greased bowl and allow to rise till doubled in bulk (about an hour). 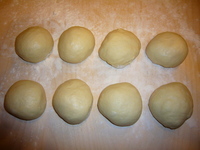 Portion the dough into 8 equal balls. Allow to rest for 10 or more minutes. 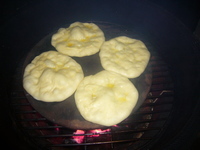 Flatten the dough balls into pancakes about a quarter inch thick, and brush tops with some more ghee. Bake on a pizza stone (4 should fit on at a time) preheated to 500, about 4 to 5 minutes per side, or until desired color is reached. Here's the nan served with tandoori chicken.